This was a difficult week to come up with a photo to share. The problem wasn't due to a lack of good material ... the problem was that there were too many good photos available! This week's photo comes from Volume 2 of The American Colony and Eric Matson Collection, which focuses on Jerusalem. These are photographs of Jerusalem taken in the first half of the 20th century before many of the modern developments were built. So much has changed in the city since that time (both physically and politically) that this volume is a gold mine of material for Jerusalem studies. The City of David when it was still being used for farmland. A German zeppelin hovering over the Old City. The interior of the Golden Gate on the Temple Mount. The interior of the Double Gate on the Temple Mount. The interior of Solomon's Stables in the Temple Mount (but see here for a similar photo). The interior of the Hurvah Synagogue before it was destroyed in the War of Independence. The Pool of Hezekiah filled with water instead of trash (but see here for similar images). Sealed entrances to the Church of the Holy Sepulcher. The short-lived and aesthetically questionable clock tower built on top of Jaffa Gate (but see here for a previous post on that subject). Remains of a Crusader-period monastery in the Kidron Valley, a small portion of which was only briefly excavated in 1937 and then buried again. Crowfoot and Fitzgerald's 1927-28 excavations in the City of David. A smog-free landscape looking east which includes the Hinnom Valley, Mt. Zion, the Judean Wilderness, the Dead Sea, and the mountains of Moab. The Jewish Quarter and the Western Wall as they looked before the War of Independence (but see here for a similar photo). Instead, I will present the following rare photo of the interior of Barclay's Gate (or at least the top section of the gate) on the western side of the Temple Mount, taken sometime between 1940 and 1946. This fascinating photograph (looking northwest) shows a room lying beneath the surface of the Temple Mount (to Muslims, the Haram esh-Sharif, or “Noble Sanctuary”). This space was the subject of several descriptions and drawings by 19th century explorers but has rarely been seen by Westerners—or photographed. Much better known, actually, is the opposite side of the thick wall seen here at the end of the vaulted room: it is the massive lintel and blocked opening of an original western entrance of the Herodian Temple Mount, the so-called “Barclay’s Gate” partially visible in the very southern end of today’s Western Wall (women’s prayer area). In the passage quoted above Barclay, alas, garbles some elements of the Muslim tradition (he calls the mythical beast a “mule” and confuses Mohammed’s Night Journey with the hegira, his flight from Mecca to Medina). Nonetheless, his notion that this “small apartment” might be connected to the gate he had identified from the outside was correct, as confirmed by other explorers only several years later. Barclay was also correct that the mosque occupied only the uppermost part of the gateway. But, whereas Barclay presumed the existence of a lower room, the mosque actually overlies a great volume of debris deposits (or fill) behind the blocked gate. In this photo, the vaulting overhead is the top of the Herodian gate passage, and the dark line in the masonry of the far wall (beneath the shallow arch) corresponds to the bottom of the great lintel (apparently the lintel itself is not visible). Experts estimate the height of the Herodian gate opening, from sill to lintel, at 25 to 30 feet (7.8 to 9.3m), with the sill lying only a few yards (meters) above the Herodian street. 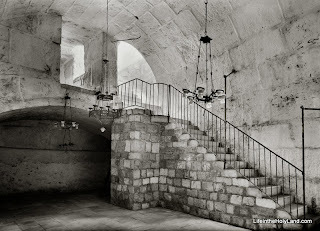 Thus, in the original gate passage here, a broad stairway no doubt ascended (far beneath the floor shown here) toward the east and the surface of the Temple Mount. The original passage ran eastward from the western wall for at least 70 feet (22 m), but it was reconfigured and altered in many ways over the ages. For example, the distinctive arch of chamfered voussoirs (beveled and molded arch-stones) seen here, and others like it, point to a major redesign and rebuilding of the passage in Omayyad times (7th-8th centuries), when the gate was still open and in use. Since the Arab chronicler Al-Muqadassi in 985 still lists the gate (called by him, and all previous Arab sources, Bab Hitta) among the active entrances into the Haram, it must have gone out of use and was blocked sometime after that date. The eastern part of the passage was walled off at some point, plastered, and used as a cistern. This photograph and over 650 others are available in Volume 2 of The American Colony and Eric Matson Collection and can be purchased here for $25 (with free shipping). Other historic photos can be seen on various pages of LifeintheHolyLand.com. You can find the links the Jerusalem pages in the left column of the homepage. Tremendous! How many times have I stared at the lintel stone from the outside and tried to imagine what was inside! Glad to be of service. Make sure you check out the related video that Todd Bolen uploaded in today's post for further images of that room.